Never let it be said that life as a dinosaur was an easy one. It was a life that was lived by many a dinosaur, full of intricacies and adventures. Those "adventures" often came at the expense of another dinosaur's life, but they still make for fascinating reads. 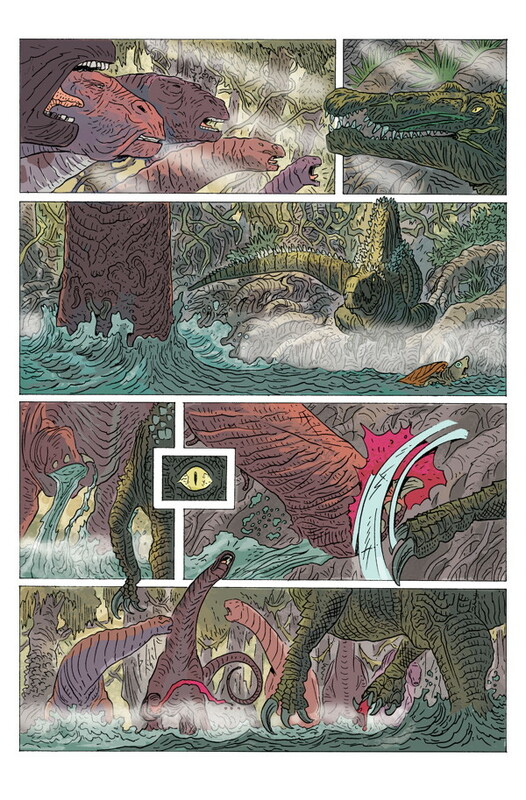 Dark Horse has an intriguing take on the life of dinosaurs in Age of Reptiles: Ancient Egyptians #1. The issue is written and edited by Ricardo Delgado and colored by Ryan Hill. 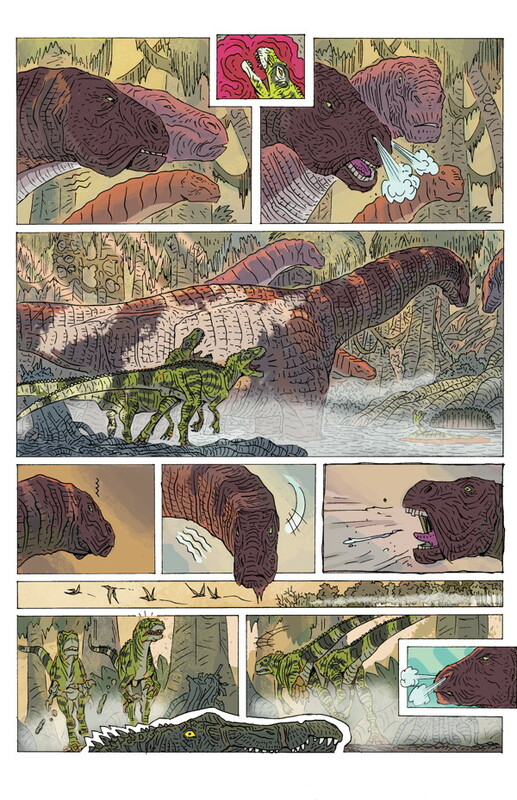 The steaming swamps of Cretaceous Africa teem with prehistoric life and primordial danger in a tale filled with villains, victims, and one of the most dangerous and unpredictable protagonists ever created: the lonely antihero Spinosaurus aegyptiacus! To call Age of Reptiles: Ancient Egyptians #1 a day in the life of the Spinosaurus Aegyptiacus would slightly undercut the fascinating tale that Delgado crafts. 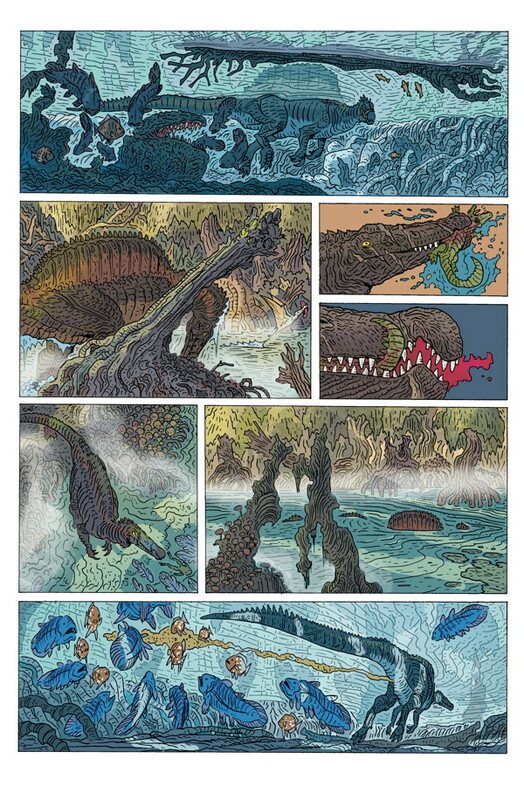 In fact, there's so much more complexity in Spinosaurus' daily interactions than just watching a dinosaur eat and sleep. 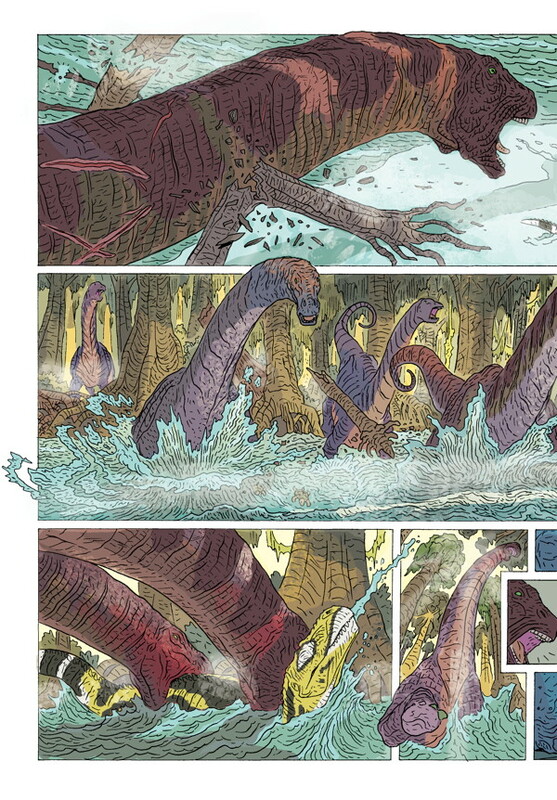 Delgado infuses Age of Reptiles: Ancient Egyptians #1 with a sense of emotion and relativity. Despite the issue being told from the point of view of the Spinosaurus, Delgado gives every creature he comes across a voice so to speak so that you can better understand both sides of the encounters. Some encounters are about food, while others are about survival, yet what they all have in common is emotion. Living in the age of dinosaurs wasn't easy for anyone involved and Delgado captures that pretty well through a slightly gritty style. It's through this style hough that the reader can better appreciate the sheer force of nature that a dinosaur actually was. 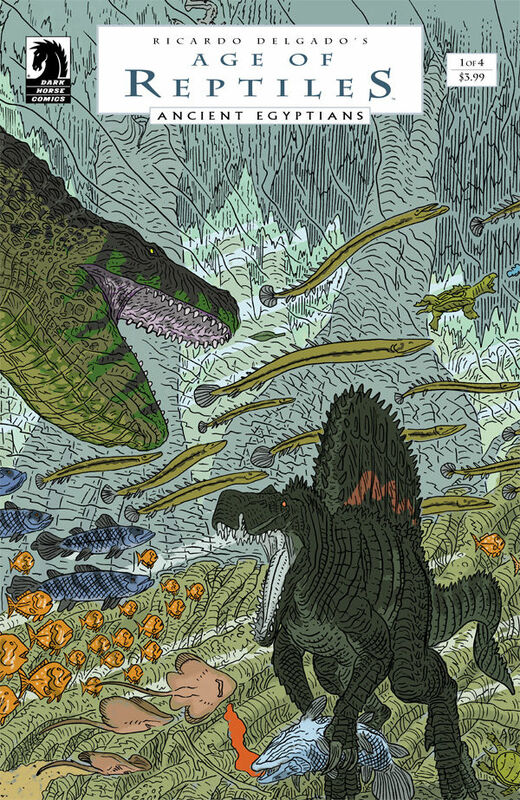 Spinosaurs swims gracefully through a massive river, a herd of Apatosauruses rumble through trees and smaller, Velociraptor-like dinosaurs fight over carrion with ferocity. That Delgado can convey such a sense without the use of dialogue is a testament to his storytelling ability and their constant, daily struggle for survival is quite a story. 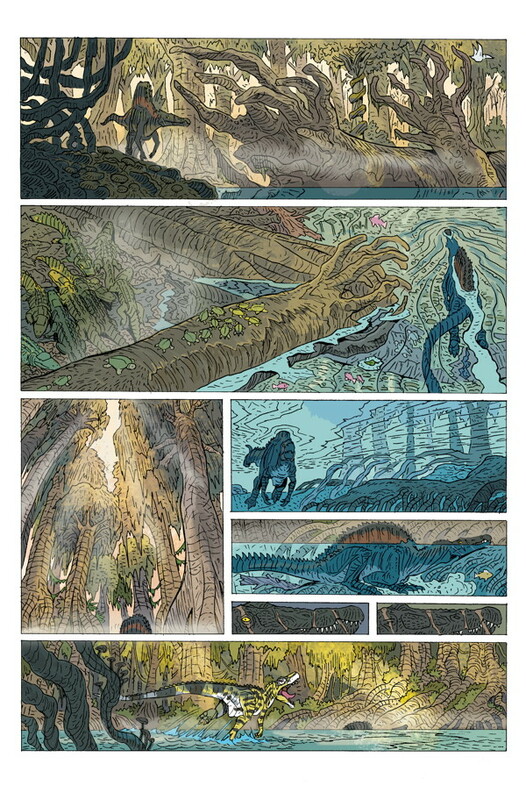 Hill rounds out the work with a color palette that's mostly green and blue, suggesting an almost serene jungle on a river setting that is quickly upended by life. 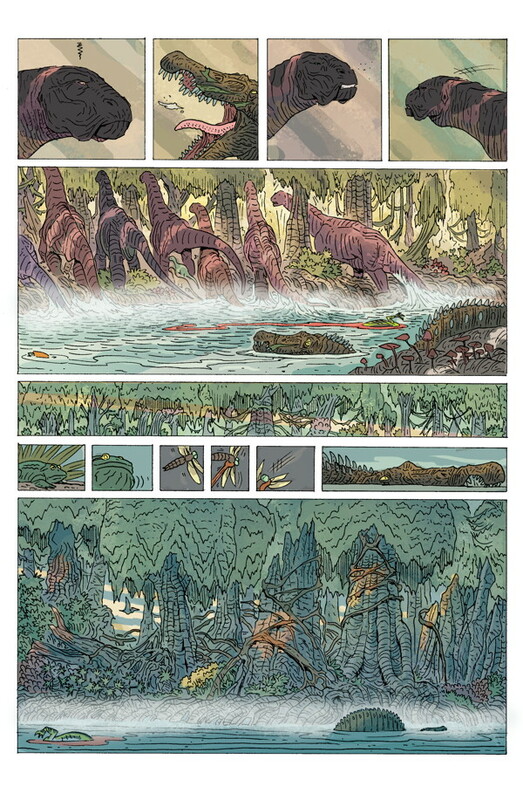 Age of Reptiles: Ancient Egyptians #1 is incredibly deep and poignant at times. The reader can get a sense of what the Spinosaurus has to contend with on a daily basis; a lifestyle that's further complicated by its desire to be alone more often than not. Delgado's story is pretty powerful despite the lack of dialogue and his art does more than enough to speak for his intentions. Each page and panel is well-thought out and feels appropriate, capturing another angle from a fascinating era. 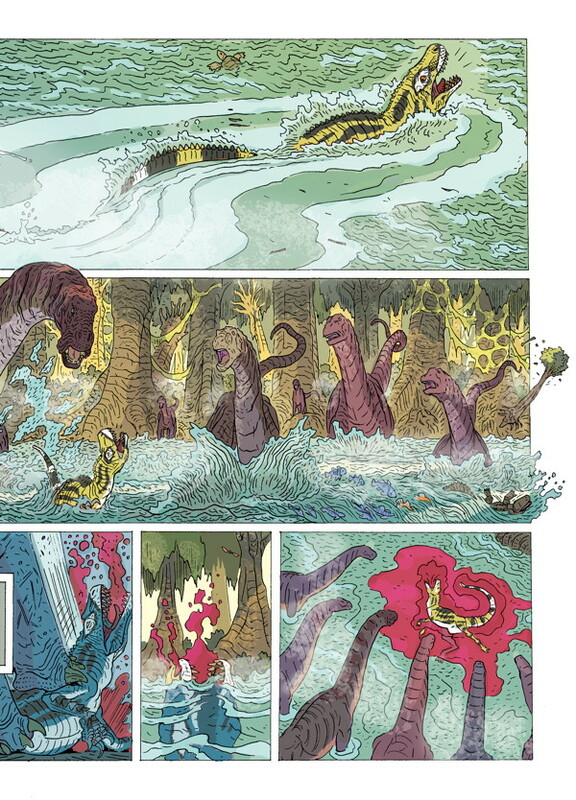 Age of Reptiles: Ancient Egyptians #1 is a completely enjoyable book that reads almost too fast, but you'll definitely want to back and read it again to fully appreciate the world Delgado is opening a window into. 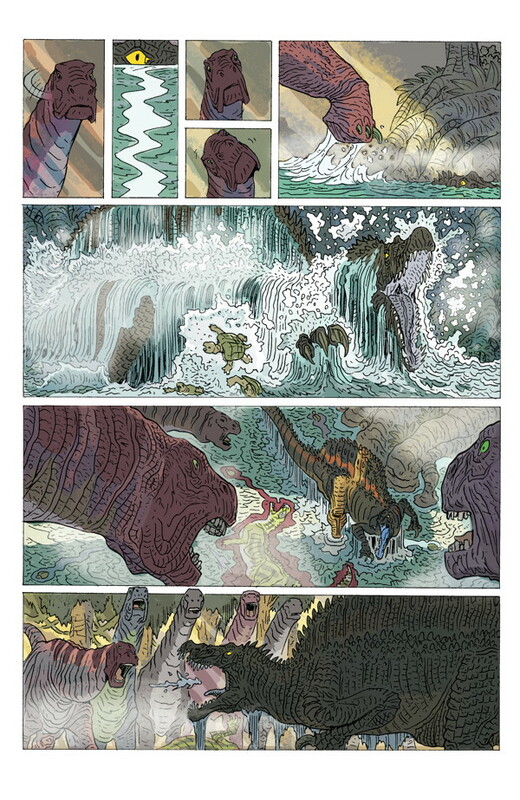 Age of Reptiles: Ancient Egyptians #1 is in stores now.